At Jonesborough Animal Hospital Your Pet is Our Pet! At Jonesborough Animal Hospital, we strive to provide excellent veterinary care and customer service. Our professional veterinarians and staff are dedicated to providing the highest quality veterinary services for your family pet. We offer full-service diagnostic, medical and surgical care for both dogs and cats. We emphasize preventative care to keep your pet healthy, and provide comprehensive veterinary medical care, surgical and diagnostic services. Jonesborough Animal Hospital is equipped to provide the most up-to-date preventative veterinary care, digital x-rays, in-house laboratory testing, dental care, and anesthetic monitoring. We offer additional boarding facilities to accommodate cats. 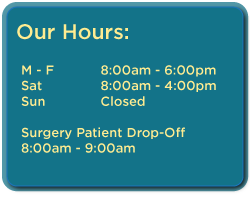 Please take a moment to contact us today, to learn more about our veterinary practice, and to find out more information about how we can serve the needs of you and your family pet.